Q. I was diagnosed with celiac disease five years ago, then went for my annual physical last week and found out I also have type 2 diabetes. My mom, aunt and grandfather all have it, but it was still a surprise. How am I going to manage a gluten-free diet along with a diet for my diabetes? A. Getting a diagnosis of type 2 diabetes can be overwhelming, and you are correct that family history plays a role in its development. Ask your doctor to refer you to a registered dietitian nutritionist (RDN) who has experience treating both diabetes and celiac disease. He or she can help you plan the most balanced, varied and enjoyable diet that meets the needs of both conditions. Selecting foods appropriate for both diabetes and celiac disease may seem daunting at first, but the diets really can work well together. Selecting balanced meals including lean meats and protein, whole grains, dairy, fruits, vegetables and healthy fats can go a long way in controlling your blood sugar. Pay attention to the Nutrition Facts panel, with particular focus on the amount of total carbohydrate. You and your dietitian, diabetes educator or physician will work together to decide how much carbohydrate you should have at each meal and snack. People with diabetes often focus on the grams of sugar in a food, and while that’s just fine to note, the carbohydrate total is most important. Once you know how many grams of carbohydrate you should have at each meal, check the Nutrition Facts panel to see if the food you’re selecting fits into that carbohydrate budget. Q. I was diagnosed with celiac disease six months ago. I was a little underweight at that time, so I was happy to initially gain some weight on the gluten-free diet. But now it seems I can’t quit gaining, and it’s really upsetting me. I used to be able to eat whatever I wanted and not gain a pound. How do I make it stop? A. 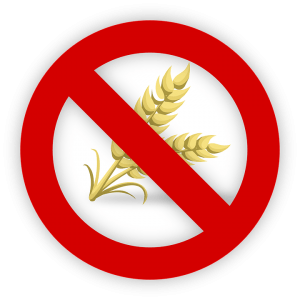 Your experience of gaining weight on the gluten-free diet is a common one, unfortunately. Just like you were initially, many are thankful to gain some weight; but that can quickly turn to frustration when the extra pounds don’t stop piling on. Several factors play a role in weight gain on the gluten-free diet. Many gluten-free foods are higher in calories and fat than their gluten-containing counterparts. When your celiac disease was undiagnosed, you were likely experiencing malabsorption, which made it possible to eat bigger portions without gaining weight. Now that your body is absorbing food better, you‘re seeing that unwanted weight gain. -Amy Jones, M.S., R.D., L.D., is a dietitian and celiac disease support group leader in Bellefontaine, Ohio.